According to the American Dental Association, only 50% of all Americans floss their teeth on a daily basis. 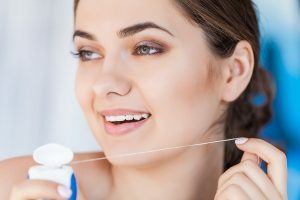 For proper flossing tips and gentle dental care in Sharpsburg, GA, check out these helpful tips from Parkside Dental Practice. Shopping for the right kind of floss doesn’t have to be complicated. 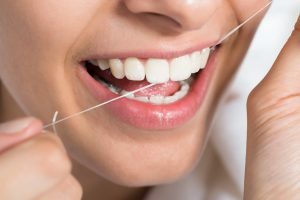 In the last few years, several companies have come out with flossing tools and picks that are supposed to make flossing quick and easy, but these pale in comparison to the original. Ignore the others and go for a standard roll of floss. They’re also more cost-effective and they last longer. You also have greater control over your flossing experience compared to the pick variety. To use a standard roll of floss, cut off approximately 18 inches and wrap a third of the string around one of your middle fingers. Wrap the other end around your other middle finger. Pinch the floss between your thumb and forefingers as you guide the string into your mouth. Flossing is a technique that’s easy to learn. The wrong technique can damage your gums and open your mouth up to infection. First, you should never force the floss between your teeth. If it’s been a while since you’ve flossed, there may be some resistance. In a sawing motion, pull the floss back and forth slowly until you get down to the gum. Snapping the string down between the teeth can cut the gums and rip the floss, rendering it useless. Pull the floss around the edge of one tooth and then it’s neighbor, hugging it with the string as you saw gently back and forth. If at any point you feel pain or see blood stop and move onto the next tooth. Repeat this process for each gap going all the way to your last molar in the back of your mouth. If you’ve had your wisdom teeth removed, you may have an extra gum flap int he back of your mouth. Maneuver your floss around and under the gum to get trapped food particles under the flap. The first time you floss you may experience some tenderness and swelling. After flossing, rinse your mouth with warm salt water. Until your gums acclimate to your new flossing routine, avoid alcohol-based mouthwash; these will aggravate your tender gums. Salt is a natural anti-inflammatory that won’t kill the good bacteria in your mouth. Saltwater will cause your gums to shrink slightly, closing up any cuts long enough for them to heal. As your gums grow stronger, switch to a regular mouth rinse that’ll protect them from gingivitis. With time and gentle dental care in Sharpsburg, GA, your gums will grow stronger and help you support a healthy smile.